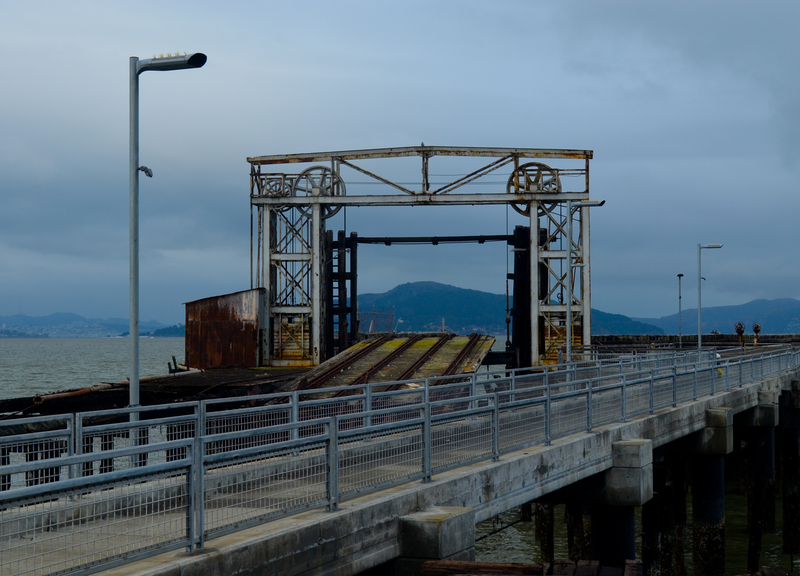 Day 11: Quantum Leaps – The San Francisco Bay Trail: It's Closer Than You Think! My Point Richmond Bay Trail trek began with a walk through a time warp. It wasn’t a time warp in the traditional sense but more of a Sam Beckett, Qauntum Leap, time warp. Bruce Beyaert was my Admiral Al Calavicci, however he was much more accurate than Al in predicting where I would end up and what would happen next. Sorry, but you’re going to have work with me on this, I loved that TV show and I don’t get many opportunities to use it as a metaphor. Point Richmond resident and Bruce’s neighbor, Tom Piazza, also joined us for the hike today. He took us on his own trip through time as we learned about his experiences as a Benedictine monk in South America – these baby boomer guys were into some crazy stuff! We began at the south side of The Ferry Port Tunnel, connecting the shoreline with historic downtown Richmond, our portal into a world quite different from what we experienced yesterday. It transferred us back over 100 years to a time when Richmond served as a point of entry into San Francisco with ferries bearing a majority of the grunt work, transporting people and cars across the bay. Today the remnants of the ferry landing hang high in the air, standing sentinel over the waters off Point Richmond like a massive steel di Suvero sculpture, moving parts and all. Perhaps di Suvero paid Point Richmond a visit at one time and was inspired by the massive steel works that were born from a city of industry that helped define, not just the Bay Area, but a way of life in America. Richmond was the location of the Kaiser Shipyards. The Kaiser Shipyards employed thousands of Rosie the Riveters, our home-based heroines of World War II. And with the women hard at work building ships while their husbands fought overseas, came the necessity of employer sponsored day-care as well as health insurance. And with that, Kaiser Healthcare was born. While I am on the subject of industrial influence, The old Ford Assembly Plant has come full circle as well – from car building to tank building to derelict “let’s tear it down” eyesore to an example of exactly why such things should not be torn down. After being fully restored, it now houses, not assembly lines to manufacture cars or tanks, but companies such as outdoor apparel maker, Mountain Hardware and solar industry powerhouse, SunPower. In fact, employees at SunPower are encouraged not to drive to work here, but to ride their bikes. Oh, the dichotomy of what was versus what is! Automobiles still figure prominently here however, making their first entry into North America at Port Richmond, creating a sea of thousands of cars that extend right up to the stark contrast of the green waters of San Francisco Bay. The best place to view this is about three miles east of Ferry Point, from the top of a small hill 118 vertical feet above the Bay Trail overlooking the S.S. Red Oak Victory and former ship building bays. The views from here extend for many miles in every direction. The old ship building bays now sit empty but, after standing there for a while and thinking about what was, you can still hear the sounds of steel being fastened into ships and feel the urgency to build more, build faster – and win the war. If you need more coaxing to feel this vibe, you must visit the Rosie the Riveter museum to get a true sense of life on the home front during World War II. Al (Bruce) and I took this opportunity to rest our feet and watch a 25 minute World War II film in the theater before making our way to Point Isabel. The Rosie the Riveter World War II Home Front park is a must see and worth a special trip. The award winning architecture and friendly and knowledgeable volunteers and staff enrich the experience even more. Exiting Rosie the Riveter propelled us back into the present and we found ourselves strolling along cleanly paved paths, through marinas, by five star restaurants and newly formed wetlands. Gone were the ships, empty bays, ancient ferry landing and brick making kilns. After Al (Bruce) brought us both back to the twenty-first century I came to realize just how much more respect this town deserves. Richmond has some serious historical clout and has influenced all of our lives in ways you could never imagine. BART beckoned me about a mile due east from our stopping point at Point Isabel today. It would have been an easy 25 minute walk straight up Central Ave, however I ventured south a bit and walked the El Cerrito Creek trail along the base of Albany Hill toward San Pablo Avenue, still needing a little more trail even after twelve miles. I got to the BART train with little time to spare. In fact I am certain I would have missed it had I not been so well equipped with my Clipper card. This time it was scan, run, ride!